International soccer tournaments are always exciting to watch, but, they can also be predictable when you pair powerhouses against inexperienced or poorly funded teams. No doubt we will get our fair share of uneven matches during this year’s World Cup Tournament, but none of those will include the teams in group D.
This group is perhaps the most balanced and competitive, with teams like Argentina, Iceland, Croatia, and Nigeria. When it comes to predicting which team will win the group and which one will take the number two seed, the experts at www.AcePerHead.com were cautious in their response. According to them, anything can happen in this type of tournaments, in the end, the predictions were split, everyone believes Argentina will advance, but for second place it could be a tossup, I guess we will have to wait and see. The glory days of Argentina are long gone or, so it seems, this team which once dominated the world stage barely qualified to this year’s World Cup. Despite having big players like Lionel Messi in its lineup, Argentina will have to prove that they belong in this tournament, and they won’t get an easy pass, group D is possibly the most exciting group in this tournament. The one thing we will be looking forward to is finding out if Messi finally learned how to play with a team other than Barcelona. He showed promise during the qualifiers scoring seven goals and saving the team by beating Ecuador. They have experience, and this can go a long way, but, will it be enough? We all fell in love with this team and their “thunderclap” four years ago; they also beat England in the Euro 2016 quarterfinals, which shows how impressive they can be. Iceland is a tremendously strong collective to face, and their passionate fans fuel them, and, being the smallest country (population 334,000 at the time of qualifying), they must feel a broad sense of responsibility to their country. One thing is for sure, watching Iceland play on such a prestigious international world stage is soul changing experience, it reminds us of this sport is supposed to be. I think we all expected more of Croatia, they have incredibly talented players at their disposal, and yet they struggled through the playoffs to make it to their second consecutive World Cup. When you think of players like Luka Modric the midfielder for the Real Madrid, Mario Mandzukic the forward for the Juventus, Ivan Rakitic, a midfielder for Barcelona, or Ivan Perisic winger for the Inter, you can’t help but think this is going to be a tough a team to beat. While they are not the favorites in this group, they do have an excellent chance of finishing in second place. They were the first team from Africa to qualify, and they did so in such a convincing way that to discard them in this group would be folly. To get here, they had to defeat the current African champion Cameroon, as well as former champion Zambia, and Algeria. Their strength was confirmed with their 4-0 victory over Cameroon, and Argentina should be shaking in their cleats right now, they learned firsthand how tough this team is back in November when they played a friendly match. Nigeria was down 2-0 and rallied back to win 2-4. 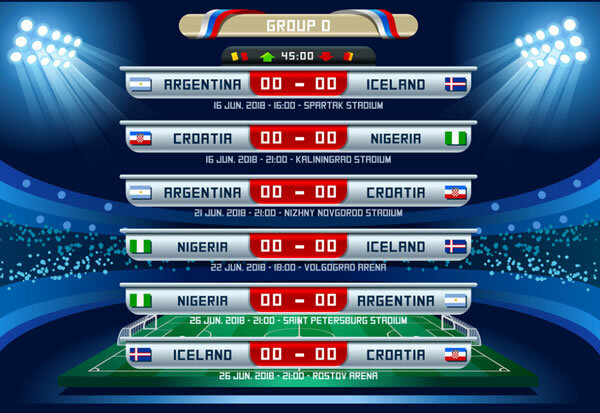 I am looking forward to seeing the matched of this group and will be watching the lines closely, although the consensus is that Argentina and Nigeria will move forward, I am hoping it will be Iceland and Nigeria.